Traditional history tells us that the first people who entered North America came across the Bering Sea, from Asia, and migrated South to the continent around 12,000 BC. But this date has often puzzled archaeologists who place the migration in South America to a much earlier date -- around 32,000 BC. How can these two dates be so far apart? 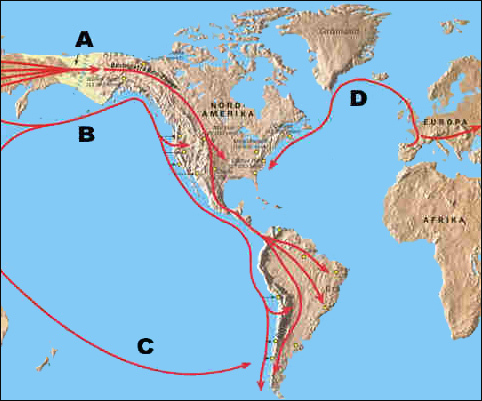 D) People from EUROPE crossed either the Atlantic Ocean or came via Russia and Siberia to America. So far there is only evidence for the Bering Strait Theory (A). Recently, scientists have started questioning the methods used to date artifacts and strata in the earth that support this early (12000 BC) date. The traditional method, Carbon-14, has been used with confidence since it is based on well known principles of physics. But while the method may be well understood, certain natural phenomenon may have interfered with the sites in the Northern Hemisphere and caused the readings of Carbon 14 to be inaccurate. Specifically, scientists now believe that a nuclear explosion or a similar event could have changed the chemistry of Carbon 14 thousands of years ago, throwing off the real dates by thousands of years! A pattern of unusually young radiocarbon dates in the Northeast has been noted by researchers and this indicate that the entire Great Lakes region (and beyond) was subjected to particle bombardment and a catastrophic nuclear irradiation that produced secondary thermal neutrons from cosmic ray interactions. The neutrons produced unusually large quantities of 239 Pu and substantially altered the natural uranium abundance ratios ( 235 U/238 U) in artifacts and in other exposed materials including cherts, sediments, and the entire landscape. These neutrons necessarily transmuted residual nitrogen (14 N) in the dated charcoals to radiocarbon, thus explaining the anomalous dates. Scientists investigated a cluster of especially young radiocarbon dates concentrated in the north-central area of North America. For example, at the Gainey site in Michigan a 2880 yr BC radio-carbon date was reported, while the thermoluminescence date (a different dating test) for that same site is 12,400 BC! Other anomalous dates were found at Leavitt in Michigan, Zander and Thedford in Ontario, Potts in New York, Alton in Indiana, and Grant Lake in Nunavut. The Grant Lake Paleo-indian site is most remarkable because its 160 BC age is fairly young, while adjacent and deeper samples give ages of 1480 to 3620 BC. Archaeologists often date material according to the known dates for the layer in which it is found. Deeper levels are usually older than the layers near the top. When measurements contradict this rule (i.e. older layers are on top of younger layers) it indicates that something has happened to the material being measured, making it appear much younger than it really is. This is especially true if there is no other evidence that the layers have been disturbed or upturned, as with some geological event like an earthquake of tectonic plate movement. This is just what scientists found in the area around the Great Lakes. Large quantities of micrometeorite-like particles appear to be concentrated near the boundary between the two layers that have conflicting dates. This suggests that some atmospheric event was responsible for the changes in C-14, and thus the dating errors. These particles can be separated with a magnet and are identified by the presence of chondrules and by visual evidence of sintering and partial melting. The particles, dissimilar to common magnetites, are found in association with a high frequency of "spherules." Also, total gamma-ray counting of sediment profiles in the various locations invariably showed increased radioactivity at the boundary of these conflicting layers of sediment. In other words, whatever happened to alter the Carbon-14 was produced in the atmosphere, was extremely hot and radioactive. The tiny spherical particles were heated at an extremely high temperature during their high-speed entry into the atmosphere. The depth of penetration into the sediment layers implies that these particles entered with substantial energy. Simulations estimate a velocity of about 0.4 kilometers per second. The evidence of this event is highest at the Michigan, Illinois, and Indiana sites and decreases in all directions from this region, consistent with a widespread catastrophe concentrated over the Great Lakes region. The nearly vertical direction of the tracks left by particle impacts at most sites suggests they came from a distant source (from space) and was not an atmospheric phenomenon near the Earth. If a large cosmic-ray bombardment impacted the earth and irradiated the prehistoric landscape with thermal neutrons, the 235 Uranium/238 Uranium ratio would be changed; 239 Pu would be produced from 238 Uranium capturing an extra neutron, followed by the decay of 239 Uranium. Neutrons colliding with nitrogen (1.83 barns) would create 14 C in exactly the same way 14 C is normally produced in the upper atmosphere, necessarily resetting the radiocarbon dates of any organic materials lying near the surface on the North American prehistoric landscape -- including charcoals at Paleo-indian sites -- to younger values. In other words, intense cosmic radiation from space would produce a bombardment of Carbon-14 atoms on the surface of the Earth. Since C-14 is lost over time, a higher C-14 reading would indicates a younger specimen while a lower C-14 level means an older specimen. This bombardment would cause an artificially higher reading of C-14 atoms when material was being tested and would result in a much younger age estimate. But scientists also learn about what caused this bombardment by examining the Uranium 235 in the sediment. Compared to U-235 in surrounding area, the ratio of U-235 under the region of the bombardment contained about 78 percent as much 235 U as the controls and later-period artifacts, suggesting substantial depletion. The depletion is caused by a bombardment of neutrons; therefore this depletion of 235 U necessarily indicates that thermal neutrons impacted these artifacts and the surrounding prehistoric landscape. Chert is a glass-like material highly impervious to penetration by any nuclear fallout that might also contribute 239 Pu. Scientists analyzed a long-exposed piece of Bayport chert by gamma-ray counting at the LBNL low-background facility for the presence of cesium-137 ( 137 Cs), a key indicator of fallout (from nuclear testing), and found none. The anomalous layers typically lie sufficiently deep that contamination by fallout is improbable. It is important to note that fallout cannot explain the depletion of 235 U. The 39,000 BC date proposed for the Gainey site is consistent with the prevailing opinion among many archaeologists about when the Americas were populated. It is also in agreement with dates for South American sites. The proposed date for the Gainey site also falls closer in line with the radiocarbon date for a Lewisville, Texas, Paleo-indian site of 26,610 BC, and radio-carbon dates as early as 20,000 BC for Meadowcroft Rockshelter. Since the Lewisville and Meadowcroft sites were likely exposed at the same time to thermal neutrons, we estimate that their dates should be reset to 55,000 BC and 45,000 BC, respectively. It is likely that Paleo-Indians occupied low latitudes during the full glacial and migrated to more northerly areas as the ice front retreated. Therefore the pattern of dates makes sense from the archaeologist's point of view. Dates for North American sites should generally be reset by up to 40,000 years, depending on latitude and overburden! Geologists believe that before 15,000 BC, the Wisconsin glaciation covered the more northerly locations where Paleo-indian sites have been found. 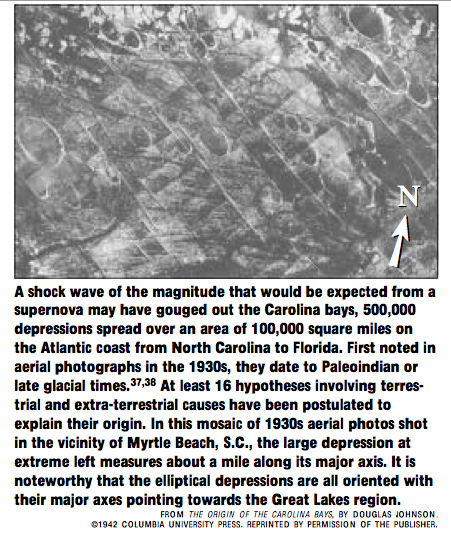 The ice sheet would have shielded the landscape and any artifacts from an irradiation. The modified dates for Paleo-indian settlements suggest that the timetable for glacial advance sequences, strongly driven by conventional radiocarbon dates, should be revisited in light of the evidence presented here of much older occupations than previously thought." The evidence from tree rings and marine sediments shows the event happened mainly to the Northern hemisphere. A large nuclear bombardment should have left evidence elsewhere in the radio-carbon record. It is well known that radiocarbon dates are increasingly too young as we go back in time. The global Carbon Cycle suggests that 14 C produced by cosmic rays would be rapidly dispersed in the large carbon reservoirs in the atmosphere, land, and oceans. We would expect to see a sudden increase in radiocarbon in the atmosphere that would be incorporated into plants and animals soon after the irradiation; after only a few years, most of the radiocarbon would move into the ocean reservoirs. The 14 C level in the fossil record would reset to a higher value. The excess global radiocarbon would then decay with a half-life of 5730 years, which should be seen in the radiocarbon analysis of varied systems. This occurrence can be dated precisely to 12,500 BC, an average of the remarkably consistent concentration peak centroids in the Greenland ice core data. Significant increases at that time are not found in comparable data for the Antarctic, which indicates that the cosmic ray irradiation was centered in the Northern Hemisphere. Weak evidence of an occurrence at 12,500 BC is seen in the radiocarbon record for marine sediments near Venezuela, confirming that the cosmic ray bombardment was most severe in northern latitudes. Lunar cosmogenic data also show evidence of increased solar cosmic ray activity at or before 20,000 BC, although these data are not sensitive to earlier irradiation. Could it have been a supernova? Sonett suggests that a single supernova would produce two or three shock waves, an initial forward shock and a pair of reverse shocks from the initial expansion and a reflected wave from the shell boundary of a more ancient supernova. A candidate for the reverse shock wave is the supernova remnant North Polar Spur, with an estimated age of 75,000 years and a distance of 130 parsecs (424 light years), conveniently located in the north sky from where it would have preferentially irradiated the Northern Hemisphere. Assuming the Taylor flux is average and 1,000 neutrons are produced per erg of gamma-ray energy, the catastrophe would have released about 10^16 erg/cm 2 (2 x 10^8 cal/cm 2 ), corresponding to a solar flare of 10^43 ergs or a gamma-flash of 10^54 ergs from a supernova about 1 parsec away. The geographical distribution of particle tracks, 235 U depletion, and 239 Pu concentration are quite consistent, although the particle tracks seem to be confined to a smaller geographic area. They indicate energy released over the northeastern sector of the U.S., with maximum energy at about 43 degrees N, 85 degrees W, the Michigan area of the Great Lakes region. *Some scientists have proposed, based on the existing record of solar flare intensities, that solar flares as large as 3 x 10^38 ergs should be expected every 100,000 years. *Other scientists estimate that supernovas release 10^47 –10^50 ergs within 10 parsecs of Earth every 100 million years. *One scientist suggests that a supernova impacted the earth in Paleo-indian times. This is supported by evidence from the 14 C tree ring record that supernova #SN1006, which occurred at a distance of 1300 par-secs, produced a neutron shower of 2 x 10^8 n/cm 2. Other research shows evidence of the past six nearby supernovae from the thermoluminescence record of Tyrrhenian sea sediments. So was it a supernova or a solar Coronal Mass Ejection? Whatever it was, the Paleo-indian catastrophe in 12,500 BC was large by standards of all suspected cosmic occurrences. We know that normal geomagnetic conditions would usually focus cosmic rays towards the magnetic poles, concentrating their severity in those regions. However, low magnetic field intensity during a geomagnetic excursion may have allowed excessive cosmic rays to strike northeastern North America, as was the case with this event. If this was the case, did the event happen during a period of reduced magnetic polarity? Scientists tell us that a severe solar flare could cause the Earth's magnetic field (and ionosphere) to collapse. So it is possible that the collapse happened as a result of the bombardment of radiation. Many scientists believe that the size of the initial catastrophe may be too large for a solar flare, but a sufficiently powerful nearby supernova or cosmic ray jet could account for it. It also is possible that the catastrophe could have initiated a sequence of events that may have included solar flares, impacts, and secondary cosmic ray bombardments. The enormous energy released by the catastrophe in 12,500 BC could have heated the atmosphere to over 1000°C over Michigan, and the neutron flux at more northern locations would have melted considerable glacial ice. Radiation effects on plants and animals exposed to the cosmic rays would have been lethal, comparable to being irradiated in a 5-megawatt reactor more than 100 seconds. The overall pattern of the catastrophe matches the pattern of mass extinction before Holocene times. The Western Hemisphere was more affected than the Eastern, North America more than South America, and eastern North America more than western North America. Extinction in the Great Lakes area was more rapid and pronounced than elsewhere. Larger animals were more affected than smaller ones, a pattern that conforms to the expectation that radiation exposure affects large bodies more than smaller ones. Sharp fluctuations of 14 C in the Icelandic marine sediments at each geomagnetic excursion are interesting; because global carbon deposits in the ocean sediments at a rate of only about 0.0005 percent a year, a sudden increase in sediment 14 C may reflect the rapid die-off of organisms that incorporated radiocarbon shortly after bombardment. Massive radiation would be expected to cause major mutations in plant life. Maize probably evolved by macro-mutation at that time, and plant domestication of possibly mutated forms appears worldwide after the Late Glacial period. For example, there was a rapid transition from wild to domesticated grains in the Near East after the catastrophe. Much of what we assume about the Paleo-indian period and the peopling of the Americas has been inferred from conventional radiocarbon chronology, which often conflicts with archaeological evidence. This work mandates that conventional radio-carbon dates be reinterpreted in light of hard terrestrial evidence of exposure of the radiocarbon samples to a cosmological catastrophe that affected vast areas of North America and beyond. A nuclear catastrophe can reset a group of unrelated artifacts to a common younger date, creating gaps and false episodes in the fossil record. Geographical variation and complicated overburdens may further confuse the interpretation. Scrutiny of Paleo-indian artifacts and the North American paleo-landscape, associated stratigraphic sediments, coupled with continued radiological investigations, may provide more evidence for the cosmic catastrophe and new clues to the origin of Paleo-indians. Body Mind Spirit || Back to Viewzone || Comments? || Ice Rock Hits America?